Good morning everyone! Babi has such a great "voice" to her blog, that I'm happy to be guest-posting for Babi while she is away. 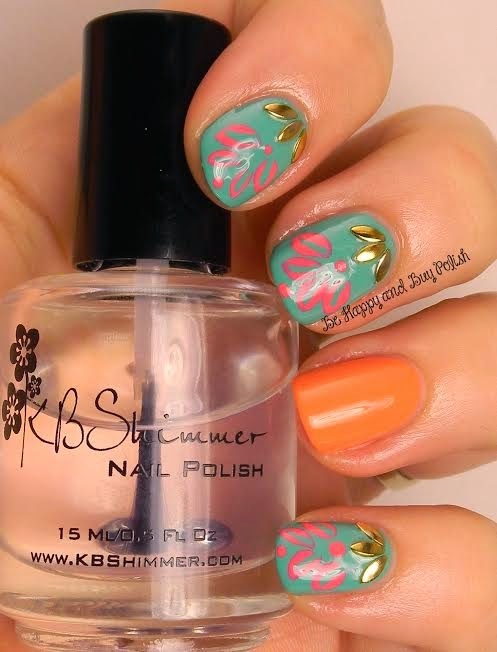 For the nail art look today, I really wanted something eye-popping bright and reminiscent of an Indian design. I started off with two coats of Jessica Cosmetics Dynamite Teal on three fingers, and Jessica Cosmetics Monsoon Melon on my accent nail. I then used Jessica Starfish Glow to create designs that complemented the studs that I also used. I hope you enjoy this look that I created! You can find me at my blog, Be Happy And Buy Polish, and also on Facebook, on twitter, on instagram, and on tumblr. Thanks Babi, for letting me guest post!